Pardon the coffee stain (not mine) but groove on the technique! Gotta love those screws, for opening a wine bottle perhaps! Makes my knees want to go akimbo just lookin' at YC! The wild west cover font? 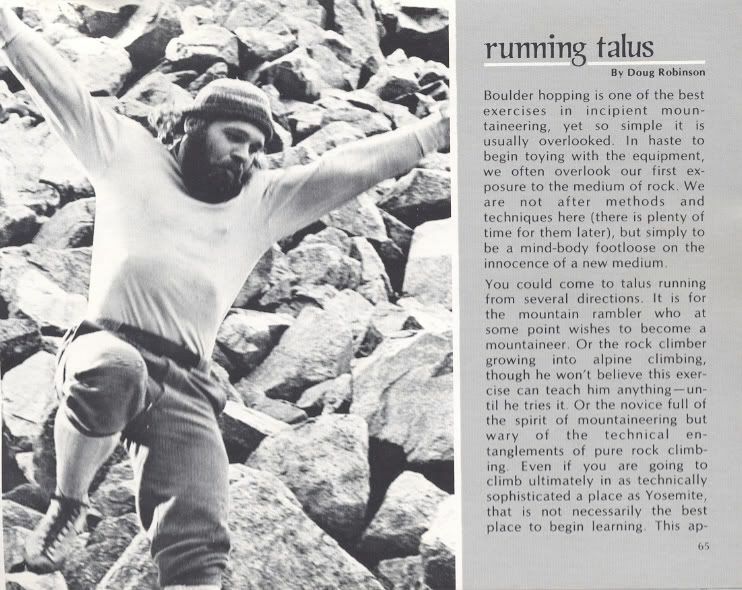 was Doug Robinson's Talus Running article in '76? Very cool. I had a Ultima Thule pack when I was a young teen ager. Did an outward bound style trip with it starting in the pinto basin and exiting down rattlesnake canyon in Indian Cove. Very cool pack. 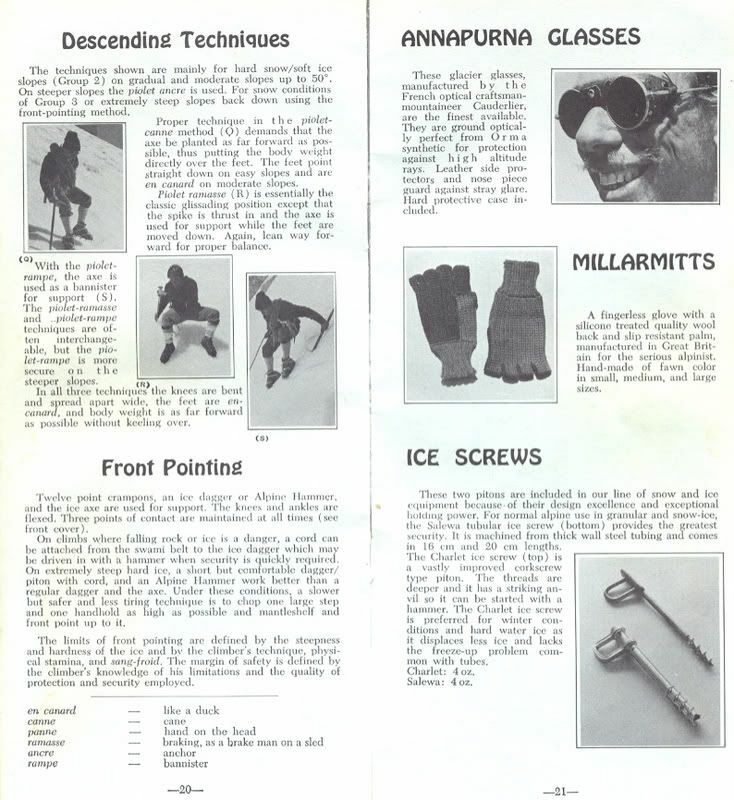 I still have that ice screw, and a knock off of those crampons in may "active" gear. Screw I've been carrying for years waiting for a chance to bail and leave the thing behind on a bail. 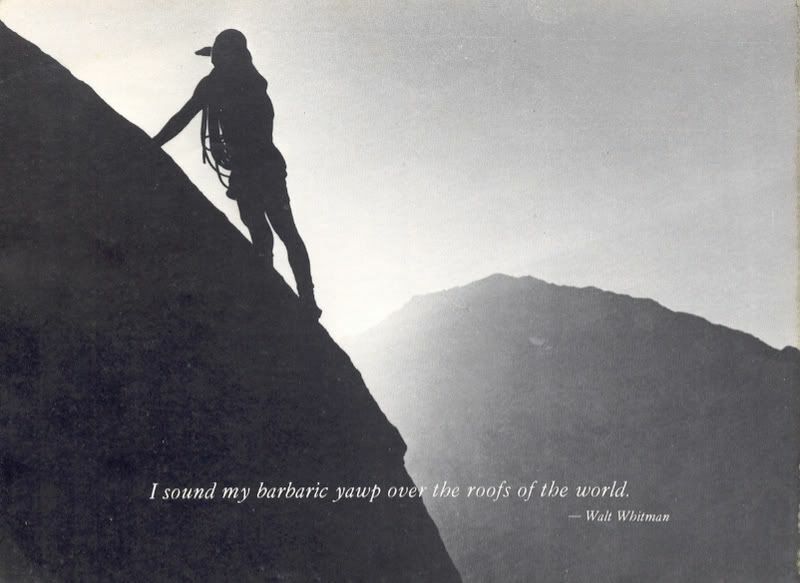 YC was definitely my hero growing up. I sold my bamboo shaft piolet years ago. Kind of miss it. I have the 1975 catalog right here, Ray so hang tight! 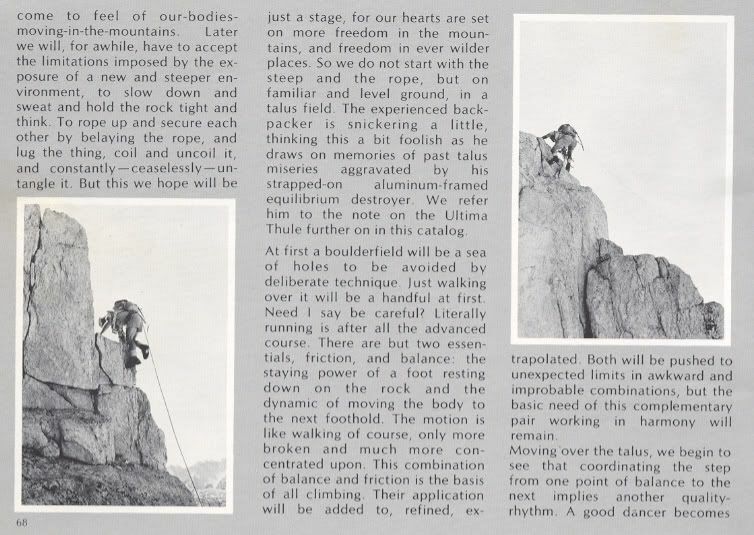 Talus running wildmen will appear shortly. Comin' at ya from stage left. Gotta love Mr. Robinson's neighborhood! 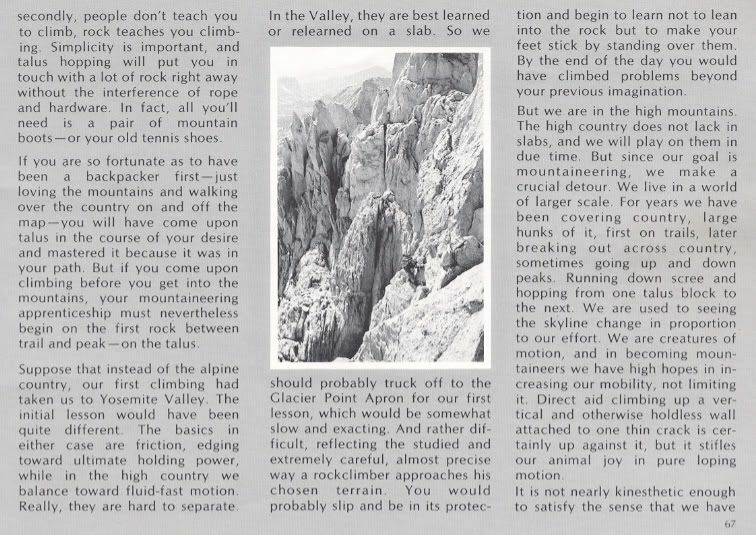 "One does not face falling into a cauldron of Winnebagos..."
How rad is that?! Thanks Steve! Death by Winnebago, I had forgotten that the realms of demise had that category! I always wondered what DR was running away from. Must have been a JT episode early on. I lost my copy of the catalog, but perhaps you could do me a favor. 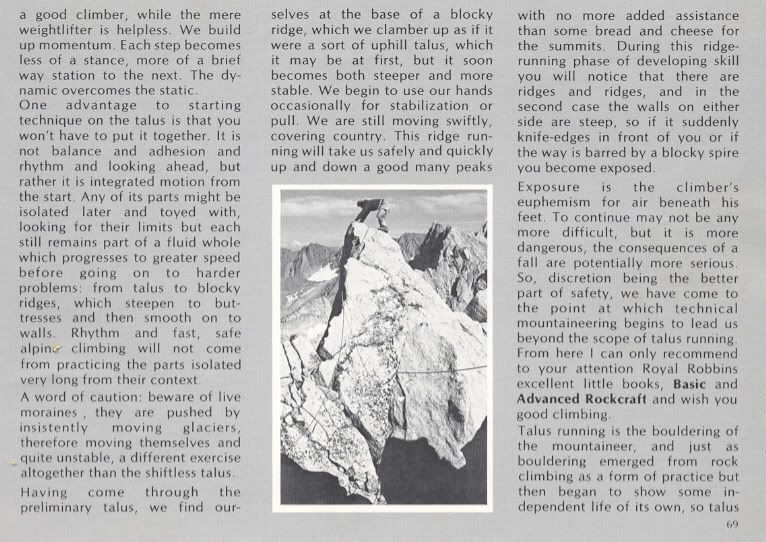 Post up the photo with the quote "loose your dreams and you'll loose your mind"
James, that would be in the 1972 clean climbing catalogue (mine is buried right now) and captions a pic of the Moose's Tooth. Go to Frostworksclimbing.com and you should find it. Edit: Regrettably, as a highschool student, I cut that very quote out for a coat of arms art project. 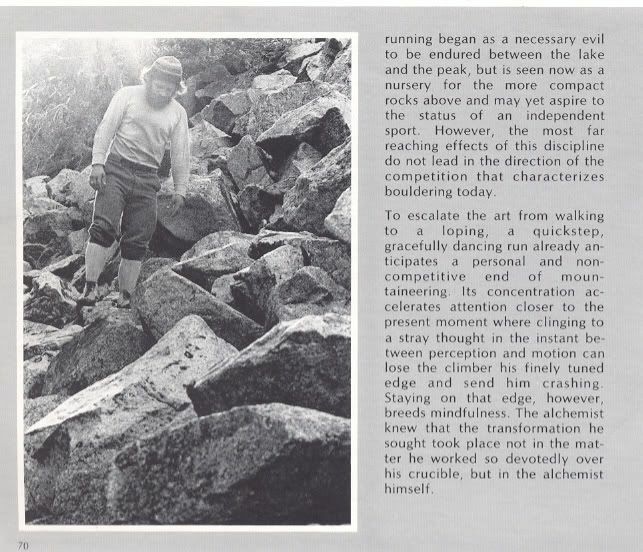 I'd have to go digging for that classic old Patagonia buttshot. The photographer was lurking around the C4 lot, identified herself, and said she was looking for oldschool clothing because pics of the stuff made YC happy. I went back to my tent and proudly put on the coffee colored garb of yesteryear. She blanched a little when I happily showed her the plate-sized sardine oil stain on one leg while telling her I'd never washed those pants because I was convinced that any laundering would hasten their demise. I should say the only thing bad about the whole deal was the slightly smarmy caption, "Tailor wanted, no experience necessary." Just ain't what you'd really find on the C4 bulletin board. Got two pairs of new wall pants for my effort. Steve, thanks for pointing out the right catalog. Seeing those crampons made me go and dig mind out. 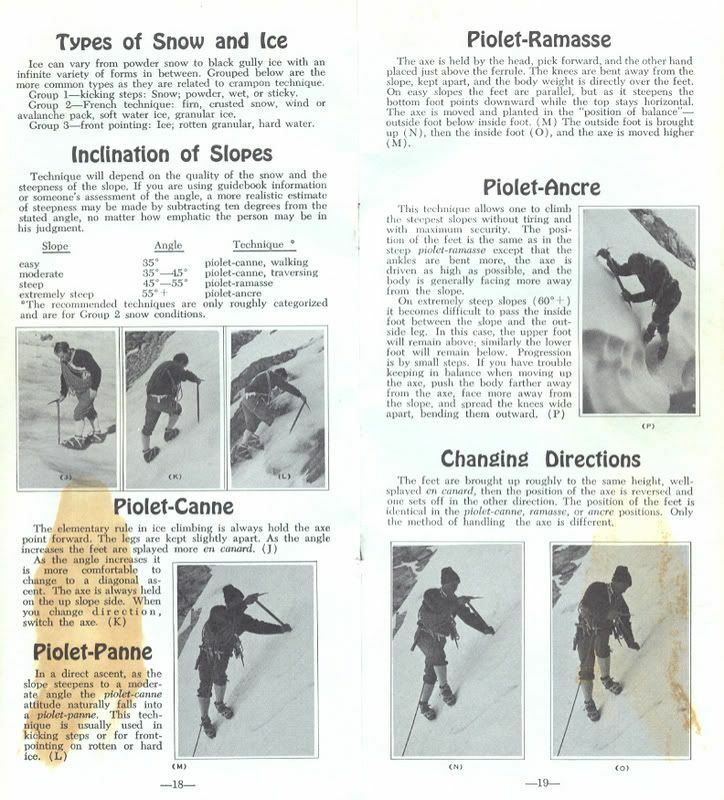 I bought them in the early seventies and were matched up with a pair of Super Guides. 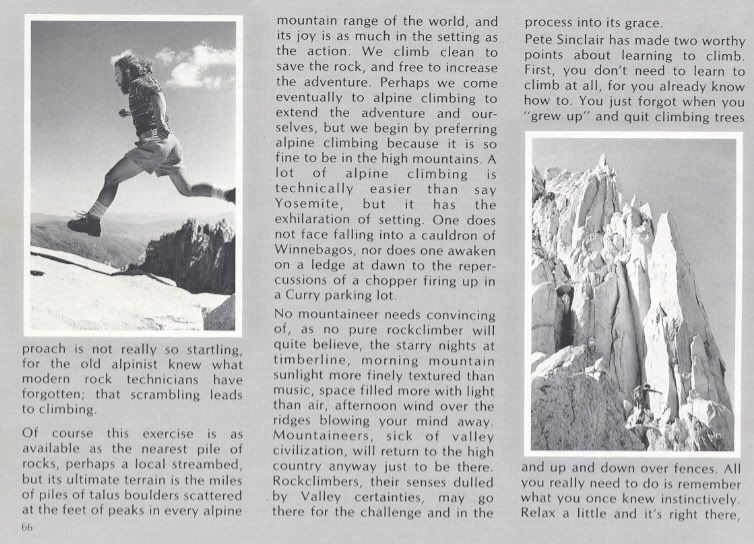 Later I used them on Scarpa Invernos, but in the mid nineties I figured the crampons should be retired before I was left stranded with a broken rig. 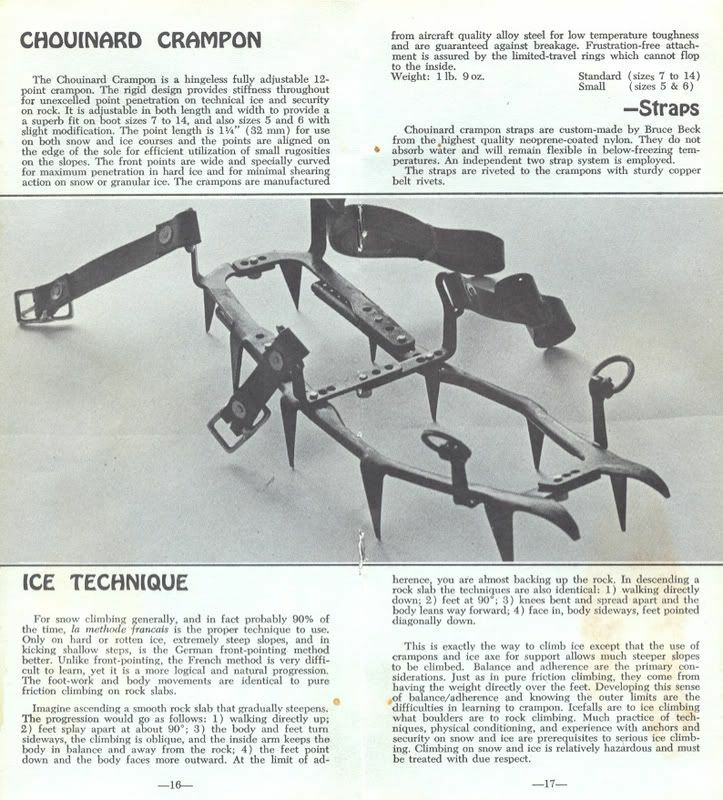 I included a Charlet ice screw and a Salewa ice hog. 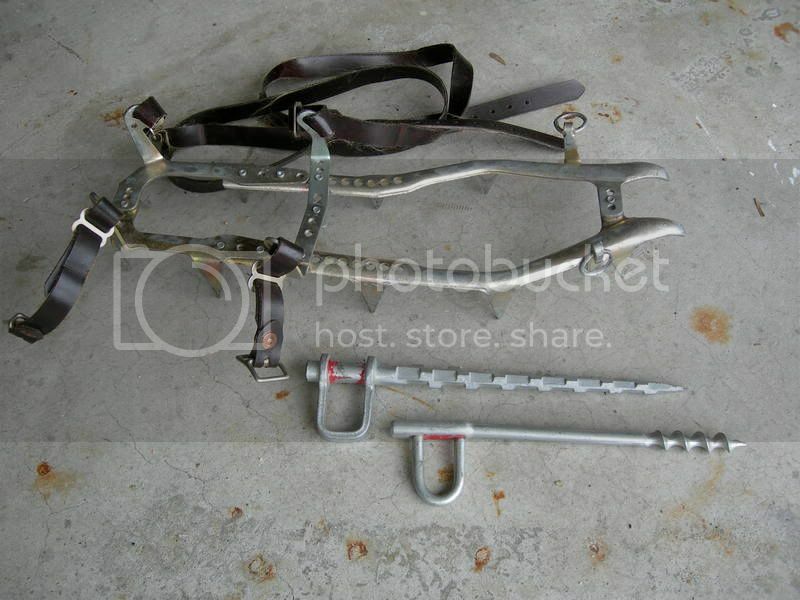 I can't say the Charlet screw saw any action, especially when there was a Salewa tubular screw on the gear sling. That old Warthog does make a dandy dagger. I wonder if YC is using one on the catalog cover shot? Steve, your memory is better than mine. The Warthog was great cause it could be hammered in but screwed out. I was half right calling it an ice hog.